NES Dr. Mario (JPN/USA) in 01:12.83 by CtrlAltDestroy. 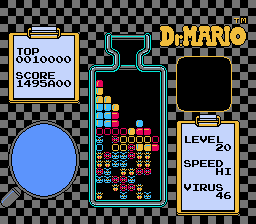 Tired of being mocked by the viruses, Dr. Mario switched to his "fast-acting" and "extra strength" medication. The viruses never knew what hit them. This video beats Level 20, Speed Hi of Dr. Mario in record time. Don't blink, or you might miss the twist ending. Check out this movie being played back on an actual NES.